No one artificially created this experience, no one wrote it, it just happened, propelled by a participant community – and nature. Bush fires, or Wild Fires you call them here, are a random killer. Especially when they driven by 100km non-directional winds in 40+ celcius heat and dry, fuel stoked forests. It can strike at any moment. People talk of having 15 seconds to escape while 30 meter tsunami-like walls of flame engulf their street, their house. Others in cities far away talk of chocking in the street from the thick smoke billowing down off the mountains. During this period my normal channels of two-way communication went into overdrive and I was deeply immersed in a real time, real life story where I and others were major participants. I would learn to value and closely follow all the story trails. 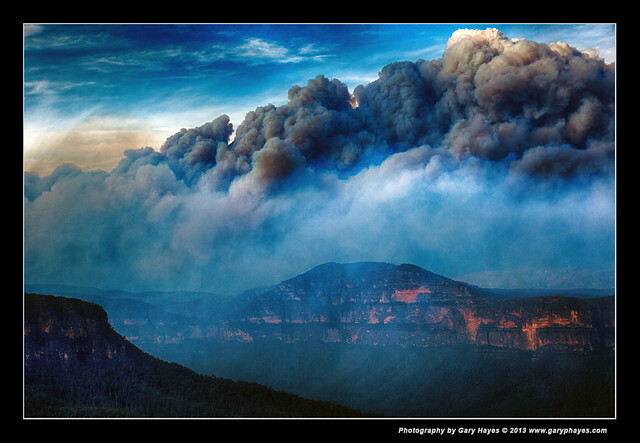 I looked out of the lounge window, a smoky dark sky, the smell of forests burning in the distance. I go to the official Rural Fire Services ‘Fires near me’ app on my mobile to see if they had it tracked and how far away it was from me. I looked out of the window and saw two helicopters filled with water flying overhead towards the area and on the background TV, ABC News24 cut into a loop and started covering a different outbreak in the Springwood area. The commissioner of the fire service appeared on TV and talked of 3 new fires at emergency level, the largest of them on a path towards us, a day or so away, for others, “too late to leave you have to shelter in your homes”. My Facebook stream updated with photos sent from more trusted photographer friends near the scene, showing people running away from another blaze and massive smoke clouds behind them. I learned to value Facebook friends instant reports as much as the official channels. I had already shared my own images of mile high smoke billowing across the landscape the day before which were actually used by two of the emergency services Facebook pages to show the ‘gravity’ of the situation. The social media messages, personal videos & updates themselves were ironically, beginning to spread like wild fire. A knock on my door, three fire service officers walked us around our house and we found water points and collaboratively talked through our survival plan. A little later I jumped into my 4×4 and drove 15 mins to the main town, Katoomba, emergency meeting – a large community of 4000 people gathered in a military style hangar, on the way there I listened to the local ABC radio with personal stories of loss interspersed with warnings, traffic news, roads covered in flames and smoke and how now the main artery out of the mountains was blocked. At this physical community meeting, I talked to locals and shared stories of our experiences so far Then 4000 people were told the worse was yet to come tomorrow, a megafire (yes that term was used) swept by 100km winds, we were told we had to make a choice, two options – leave the mountains in the morning before 11am with our most treasured possessions or stay and prepare to defend – as the fires undoubtedly would rip through most of the major towns in the area. A simple two choice, Call to Action. While at the meeting an ex ABC friend updated his facebook page, he was looking through the rubble of his house, one of 200 homes destroyed earlier in the day. A total shock to me, of the 200 homes destroyed I could never believe it was my friends. His brother had also uploaded to YouTube the last moments when they gave up trying to defend the house. ABC TV and Radio interviewed him later that night. That was Tuesday two weeks ago and it was my actual experience of one day in a pretty tough couple of weeks, which still continues. I am sure all of you here have experienced similar pervasive experiences. To quickly finish the story and that particular cliff-hanger, we decided to stay and defend. We read the step-by-step defend plan and like a rules based game, we followed the instructions and made sure everything was in place. But this was not a game – if the worse happened we may be burnt alive – but we had prepared the water tanks, petrol pumps, escape routes, hoses, cleaned debris around the house, marked fire hydrants, blocked gutters and had our treasured possessions near the door just in case we had to run for it. How and why is this relevant to my talk? The experience above had all the hallmarks of what makes compelling multi platform experience. OK, I am not saying good ‘fictional’ transmedia is all about a ‘simulation’ of reality, but there are obvious key principles of interaction leading to immersion here. I used several key words in that story that are critical to good ‘multi platform’ storytelling and good storytellers and transmedia producers would have spotted them…? These are all very important attributes that require a range of techniques required to build ‘your’ own experiences, to be in the story vs looking at ‘broadcast interactivity’ – but many do fall short, there are many distributed stories that are simply that, locked down content spread across a few platforms posing as transmedia. For me the wild fire experience was like authentic back-to-basics storytelling, episodic, growing in intensity, life or death cliff hanger decisions – but it was much more. It was personally very relevant and pervasive (all around). Although I didn’t refer to it in my presentation it is always worth a look at the ingredients that made one of the earliest experientials work too. My fire experience forcibly reminded me of a project I consulted on and that came through one of my multiplatform development labs LAMP a few years ago. Scorched, went on to win an interactive Emmy and was a story about the Eastern Seaboard of Australia ravaged by uncontrollable fires. Sound familiar? The way the real world fire spread across apps and social media was definitely something this property was trying to emulate in the days before ubiquitous Facebook & YouTube. Actually one of the production team contacted me during my ‘ordeal’ to point out how similar it all was! When Firelight Pictures devised that project at LAMP & in sessions afterwards, we drew on the many stories of bushfires in Australia to try to create authenticity. Such a commonplace event in Australia – incidentally one of the towns in the Victorian mountains where we ran a LAMP lab on 2008 was completely wiped out a few months later in some of the worst fires the state had ever seen and sadly lives were lost. This is not the example I showed during the prez as it is not online but them winning the Emmy…you might want to skip to 3.20..
We are in transition. We all know this and we could think of transmedia as a project in itself. Imagine everyone at this conference and the thousands working on it around the world are contributing to one overall ‘product’ – new form storytelling to expectant users. Lets do a quick state of the industry-like measurement of how we are doing. Looking at some key metrics… The ‘digital’ brochure-ware website/clone mobile-app industry is doing fine and dandy – quaint silos inside traditional broadcasters, studios and ad agencies make ‘broadcast interactive’ stuff that is proven standard fare for large sections of the mostly passive audience – but where are the truly original and/or mature multi platform transmedia services and how will we get there? I then thought of a series of scales on which to gauge and see if we can really get a sense of the State of Play in ‘whatever’ we will finally agree to call this thing. Another metric to consider is Trust. In a world which is already deep in the attention economy, meaning business models are simply build now on how long and if you can engage large numbers of users, what is a key ingredient of gaining their attention? I added the term Trustonomics to the Urban dictionary a few years ago to highlight the importance of gaining the trust of your community. Do they trust you enough to even click on your thing? To download the app? To spend 1-2 hours watching your linear video? Do they trust you enough to share your stuff with their trusted friends? An economy built on trust and respect for each others creativity…then comes attention and potential business models – beyond the attention or experience economy which is more about generating a call to action, the next step is the trust economy. Do users trust you enough to engage with you in the first place? Will they come back? Do they value and trust what you are doing? What is your ‘trust’ building strategy? Does it start with Crowdfunding? So to the main part of my talk. I had already started to run out of time but thought it important to deliver a little process into the conference – or at least an approach to creating these community driven, socially networked, mildly gamified story services. 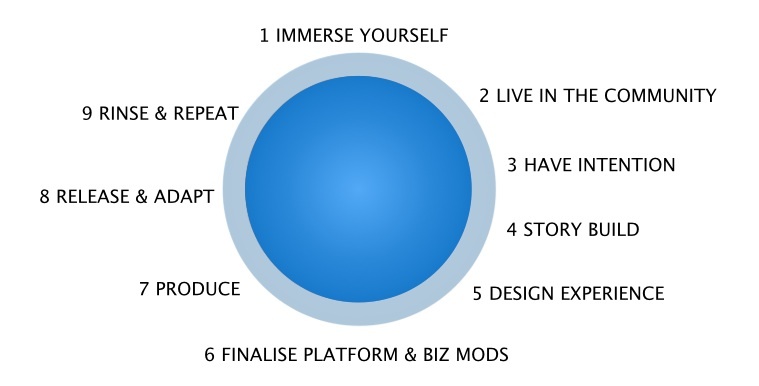 I started by referring back to the process that Laurel Papworth and I put together for a social media campaign half a decade ago and then talked about the 5 steps becoming 9 for complex multi platform design and production. I won’t have time to go through each of the above in detail, but concentrate on 1-3 , the rest I have covered in many other posts and talks although number 6 is high on everyone’s agenda at the moment. There is a lot of talk about story first, build out your world, then and only then explore platforms to tell it on. But this misses a key point, if you do not understand those platforms and how people use them, your story ‘method’ is likely inappropriate or at the very least, been and gone. Live the Multi platform environments – too many people I meet talk of wanting to develop a tablet service but have never touched one, a console game but have never owned one or something cool with Facebook but don’t have an account – I cannot stress this enough. Get in there and really understand this. It may influence they way you tell your story – in fact if it doesn’t you have no right to be telling your story on that platform. Your User Community will show you how you engage and call them to action and this is far more important than ‘clever’ generic episodic storytelling dropped ambiguously onto distributed media channels. I have long been banging the drum of experiential or pervasive entertainment, for you to achieve this you need to get your hands dirty and research and live those platforms – properly, not in an afternoon session with a kid who gives you a tour. An example of how platform can influence story is one of my last StoryLabs. Shiny is not always bad. One of my specialist areas is Augmented Reality and I often present on how, when done right, it has a great future in storytelling. In fact for trad TV/Film storytellers it fires their imagination – digital stuff layered into their ‘real’ world. Warwick Thornton (prob Australia’s leading indigenous filmmaker) was at a StoryLabs and struggling with a vehicle for his for his Darkside film (aboriginal ghost stories). When he saw the potential of augmented reality he was just blown away – he could place the stories and manifestations of the ‘spirits’ in the audiences real world…it took him to the next level – and he is incorporating this into the overall scope of the final project. A taster of the linear element below. As usual I showed my Social Media Counter to simply bring home the point that there is a lot of stuff happening all the time. What techniques are you using to be head in the noise? Have you integrated yourself into communities, do you know the influencers, have you built the foundations of a community around yourself. What data do you have on your potential user community and how might this dictate what type of stories are important to them and how they may want to collaborate. Our audiences are busy. Transmedia by implication requires users to spend time and effort moving across platforms or channels, and given the enormous range of alternatives available to them – what makes ‘your thing’ special. On average we reach for our phone 150 times per day – what is it about your ‘thing’ that makes one of those a must do. E.g: How do you encourage them to share your story elements, beyond asking them directly to spruik your property to their peers? And mobile, situated storytelling. Are you taking advantage of the fact that now 75% of web usage is now through the mobile. Don’t think creating an app is the solution… But more importantly are you really considering their location and building story elements that will be relevant to where they are. Watching the Community – behaviour can be surprising, a recent ABC TV property had a website that in the past year had 500 reviews on it. In the first week of the mobile app (which had a similar review mechanic) there were over 30 000. This was completely unexpected and should have been adapted to provide more contribution. One of my favourite examples of behaviour I still think of as important portent of where social networks may be headed. Collaborative real time creativity and performance. I showed the example of the Social Virtual World where I filmed a 2 hour performance in real time, of 20 virtual artists as avatars in a virtual arena. This was to a virtual audience of 60+ avatars and a live stream/download to hundreds if not thousands after the event. It was effectively real time machinima but in an alternate social world, where people played roles much as real life. The point about this was the behaviour opened up a lot of potential further down the road when we are more accustomed to social networked not being a page of boxes and sentences with occasional pictures, and we are more immersed in video or 3D spaces. What is the future storytelling potential as social media evolves into more 3D environments? How do you see your audience? A faceless hoard ready to devour your wonderful creations? Or perhaps you see them as friends, ready to move their gaze to you up every time you throw something at them? One of the best approaches is to develop personas for you and your creations. Persona’s are to be considered as real people who across a few archetypes represent your community. If you really understand your community this is a really easy job, if you are a broadcast person by nature, it is really hard – at first. User centric storytelling comes from knowing who you are reaching. What are persona’s why do we create them? There are two types of stories. Those told ‘at’ you and those told ‘with’ you. And I hope you know you all know what I mean by that. To venture into the ‘with’ type we need to know what are the key values your users will have for committing to spending their time with you. 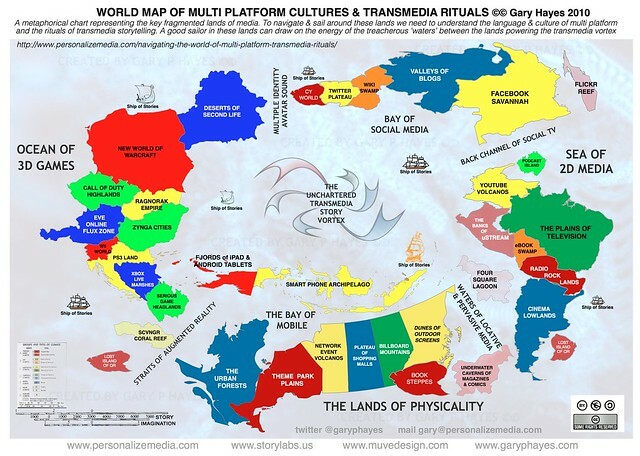 I wont bury into the obvious paradoxical semantics of that statement, but in designing a transmedia multimedia experience we need to move beyond just placing bits of connected IP across a multitude of platforms and really connect to the user, on an individual level. Devising strategies to get closer to ‘personalized storytelling’. This should be your goal as a producer in this new age where there is so much opportunity in understanding your users at a much deeper level – beyond broadcast, one way multimedia. A clear intention or goal for the project is critical. Too many projects I see are pure vanity or worst case traditional storytellers just doing digital cause it seems the right thing to do. But remember at all times with the story building – consider what it is that users will be doing at key points or even before and after the main arcs! This is far too often left off as an inauthentic afterthought. Story is important, but passive story delivered in one direction, however pervasive & across platforms, leaves nothing for the user to do and resonate with the story or others participating. An example of a new form being tried with various broadcasters is the TV Ep, Game, TV Ep sandwich (my term). This alternating format has been used of course by Defiance (who were presenting also at the conference on lessons learned from their multi million project). But I showed a much more simple variant on that with another project that went through the 1st StoryLabs, Nowhere Boys – being premiered in Australia the day of this talk. I showed it to really highlight how the story arcs were developed before Episode final scripting to allow the audience to become users between the shows and feel like they were part of the ‘story’. I also had a cautionary tale that some of the ‘story worlds’ I have been seeing lately, particularly in the sci-fi domain are actually behind reality – and one particularly that caught my eye, linking to at least three projects that have come across my radar has been facial recognition. Consider the tech out there already is more fictional than your fiction or embrace it and riff off it…again the tech can help steer story. The rest of my talk really referenced the design, platform selection, tools, business models and production methodologies and challenges – and you will see if the video pops up how much I skimmed the surface here. I stressed again the importance of the game mechanic in all things. Not gamification, simply being clear in what a user must do inside your story world, from just going to a twitter character who will direct you to the next video through to running to your city centre to pick up a package…I showed my experiential video from a couple of years ago to get people thinking about call to actions (a big post on that soon!) and other motivating factors. REACH – Another way of looking at the multi platform universe is simply by numbers. Beyond the complexities of producing linear content across borders for TV/Film, how are the numbers stacking up for global ‘web’services towards the back end of 2013? Followed by references to key business models and interactive form and how these need to be layered and integrated at this development stage. For Production a simple walkthrough of good solid documentation and why my transmedia bible is a good capture (not development) template. Also references to fail forward and testable EPOCs (electronic proof of concepts), also useful to get funding. Stages of prototyping and testing before release. But a key point I hope I got across was about people and teams. Who are you? Capable of leading a multi disciplinary team? Are you like an experienced TV/Film director, familiar with much of the film craft roles and acting to get the best out of everyone. To really produce quality in this domain you need to be part writer, part tech, part business analyst, part community manager and so on OR make sure you get a tight knit team around you who can specialise in those roles. Of course you are going to need a team anyhow BUT you need to have knowledge in each of those spaces to gain respect and understand the challenges but most importantly the opportunities. This flowed quickly into the complexity of the production process and naturally I referred to my parallel process overview comparing and ideal world of Film/TV, Multiplatform and Games all working alongside each other across the five phases of Dev, Pre-Prod, Production, Post and Marketing/Distribution – and partly referencing my State of the Industry element, the importance of using the right Content Management Tools, Development Processes and so on. The final part of the wheel is where it comes back to the start. How after release of your masterpiece into the world the real work starts. You must respond and listen, communicate with your community at all times, fix and/or modify based on your built in monitoring and measurement systems. Also build trust based on transparency – sure you don’t have to constantly break the fourth wall but you must make it clear that you are working hard to improve their experiences. This builds trust, and sets you up for the rinse and repeat, where you next project is bigger and better with a trusted community hanging on your every offering! Who are your users & what are their behaviours? Why do they need (and think they want) your ‘product’? Where, when & how will they get it? What will they DO? Game mechanic? Do YOU have clear objectives, KPIs, Learnings? Do you understand your users is it measurable? A realistic schedule & budget? Have you the right team skills? article. This is the clearest description of the future of marketing I have seen. To always have a story, not a product at the center of the message, is advice worth millions by itself.